[toc]An abscess in your tooth occurs when there is an attack of bacteria in your mouth and the infection spreads inside one of your teeth or gums. When you consume food, some of the food particles remain in your mouth and combine with this bacteria and saliva. It gradually forms a coating on your teeth, also known as plaque. Consuming foodstuff that is high on carbohydrates allows the bacteria to use the carbohydrates as energy to reproduce. It also produces acid. The bacteria and the acid combine to form an abscess in one or more of your teeth. The following are the five main causes of dental abscess. In case of a periapical abscess, the bacteria infect the tooth through the small holes that were caused as a result of tooth decay. These tiny holes are formed in the tough outward layer of the teeth. Dental fissures damage the enamel and also the dentine (the soft layer of tissue under the enamel). 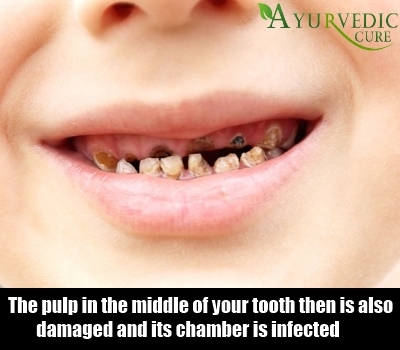 The pulp in the middle of your tooth then is also damaged and its chamber is infected. The bacteria keep spreading deeper and deeper forming an abscess. When a periodontal abscess develops, the bacteria are known to affect the gums, causing periodontitis (an acute gum disorder). Such an abscess occurs due to the presence of periodontal pockets which is a gap between the root and the base of the tooth. Once such a pocket is formed, it is very difficult to impede the onslaught of bacteria in that space. Even dental procedures are known to accidentally cause periodontal pockets. 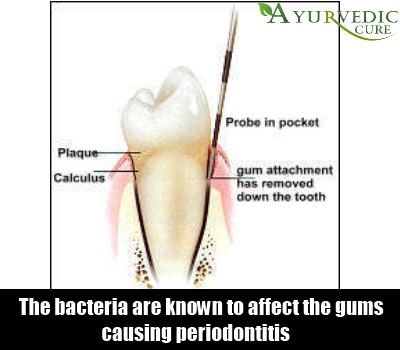 People with gum damage can also have periodontal pockets in their teeth. Food that is sweet generally sticks to the teeth and refuses to go away, sometimes even after you’ve washed your teeth. Chocolate items are a good example of such sweet foodstuff. You’ll see traces of chocolate in your teeth even after you’ve rinsed your mouth several times. Even starchy foods such as bread, biscuits and chips have a tendency to linger onto your teeth and accumulate. Bacteria act on them soon enough causing a painful abscess in the tooth or gum. Bad oral hygiene is one of the major causes of dental abscesses. If you are too casual about brushing or flossing your teeth, then there’s always a good chance that you will end up with an abscess in your tooth. This is because when you don’t clean your mouth as regularly as you should, there is an accumulation of food particles and this build-up combines with bacteria to form an abscess. Oral hygiene is therefore crucial in preventing a dental abscess. Although, it is not a major cause of dental abscess, many orthodontists have recognized the role of the immune system in the formation of tooth abscesses in many people. This can be caused by a multiple factors such as high blood pressure, diabetes, side effects of various medicines and treatments etc. Cancer patients who undergo chemotherapy have often experienced dental abscesses due to their weakened immune system. Taking steroids is also responsible for deteriorated immune systems in a lot of people. Dental abscesses can be treated. However, it must be kept in mind that the pain and trouble it entails is generally not worth it. Take a cue from these causes and prevent abscesses in your teeth.